Hey there! It's New Year's Eve and while everyone else might be getting ready for New Year's parties, I'm sitting around in my PJ's, watching Food Network and blogging and I couldn't be happier! Actually, I had a hectic morning since my camera died last night at about 1 am. I was in full panic mode, especially since I couldn't find a DSLR repair shop in Edmonton that wouldn't send the camera to Ontario to be fixed. I simply couldn't be without a camera for 6 weeks. I have a nail habit I need to take photos of and I have no ability to take decent picture with my phone! But I found a second hand one that's practically new (according to the numbers of photos that has been taken on it) at a store so I rushed out to get it this morning. I think it was the right move since repairing mine would likely have cost almost as much. Luckily I did all these manis yesterday before it died so I knew I could get these posted. 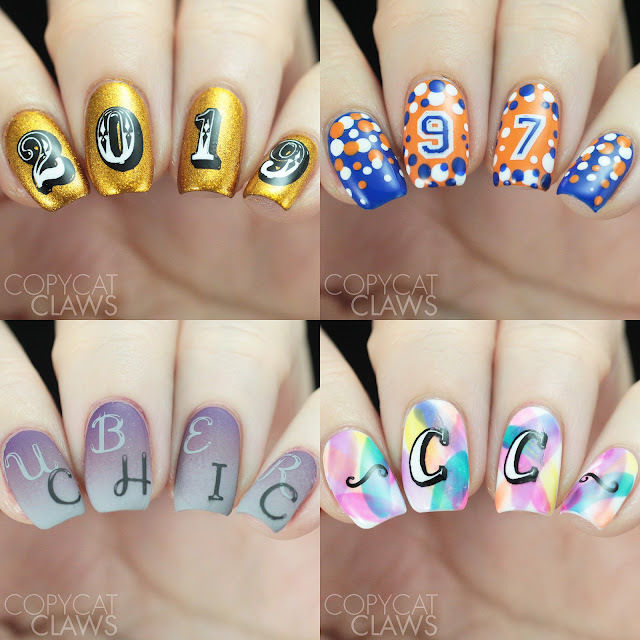 Today I'm sharing UberChic Beauty's Numbers 01 and Alphabet 01 stamping plates. These plates were released awhile ago but I didn't get them so I received them (along with the new plates) this time around. Both have the whole range of numbers/letters in numerous fonts so there should be something for any occasion. And of course the quality of the etching is great. Now onto the mani's I did with them! Hey there! 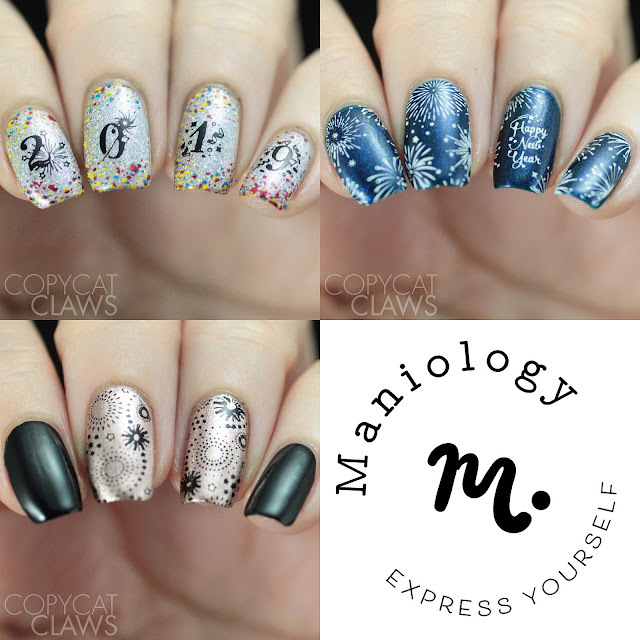 Just in time for New Year's Eve, I have a look at Maniology's M042 Sparkling Celebration stamping plate today. Unfortunately, since I'm in Canada, packages take awhile to get to me so this review isn't likely to be in time for you to get this plate in time for your celebrations this year but I think it'd be a valuable addition to any stamping plate collection. You could use this plate every New Year's...or really, any time you wanted to celebrate anything at all. In addition to the number images, there's streamers and fireworks. So many fireworks! 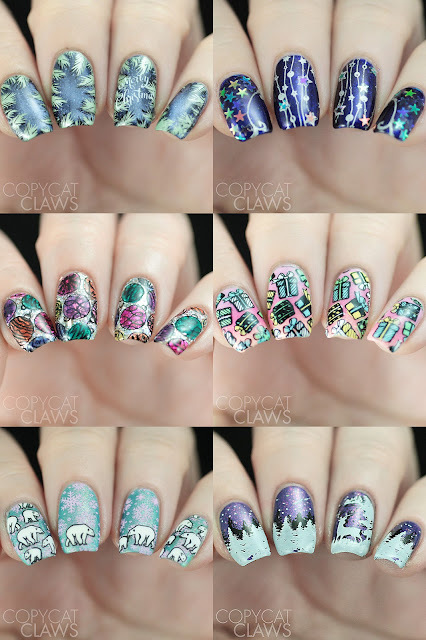 And it just so happens to be Nail Crazies Unite Fireworks day so these work for that too. I was going to do a separate fireworks blog post but this week has been crazy busy visiting with friends in town. It's been so nice seeing all my old friends but I am looking forward to some nail time. Just last night I removed my Christmas dotticure...that was 5 days with the same mani which is simply unacceptable to me, haha! Hey there! 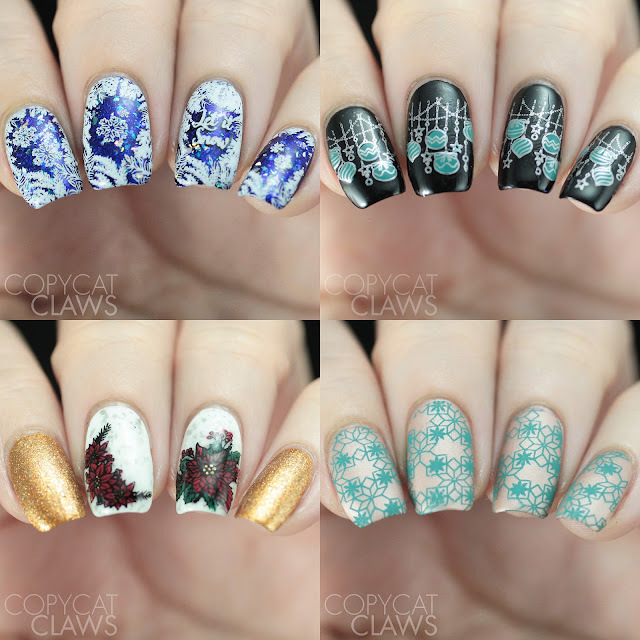 Like I've been saying lately, I have worn too many holiday manis in the last couple weeks to be able to blog them all separately so for today, I have four designs to share. One was a bit more intricate, turning a regular image into a negative space image. 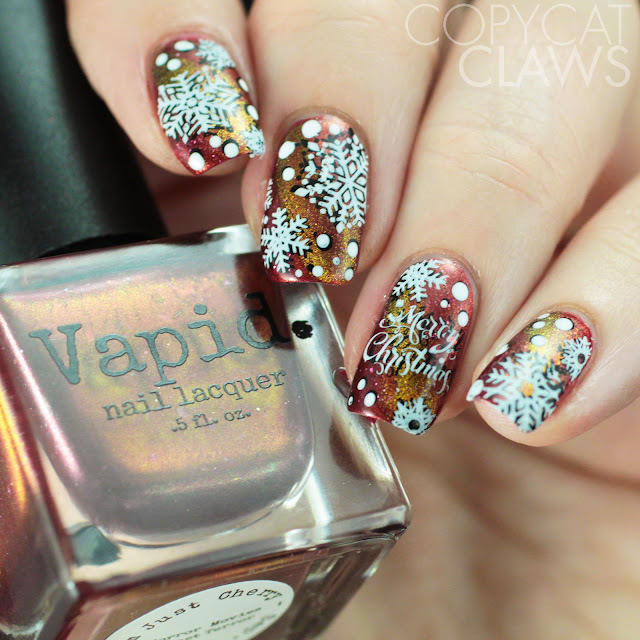 There's also one that I wanted to looks like Northern Lights but ended up as a scary Halloween Christmas mani. There's a simple one that I wore from Thursday to Sunday (partly because I liked them and partly because I was too busy/lazy to change them). 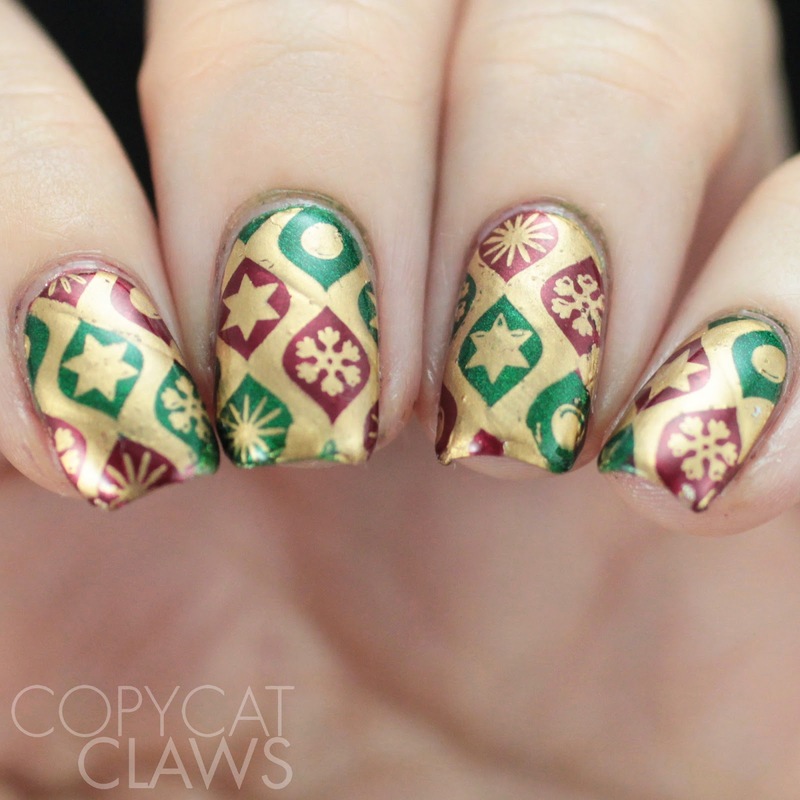 And lastly there's one that I saw yesterday and loved so much that I copied last night so I could wear this as my actual Christmas morning nails. Hope you like them! Hey there! Today I have a fun new subscription box to review for you guys! Maniology recently started the Mani X Me (pronounced "mani by me") box. 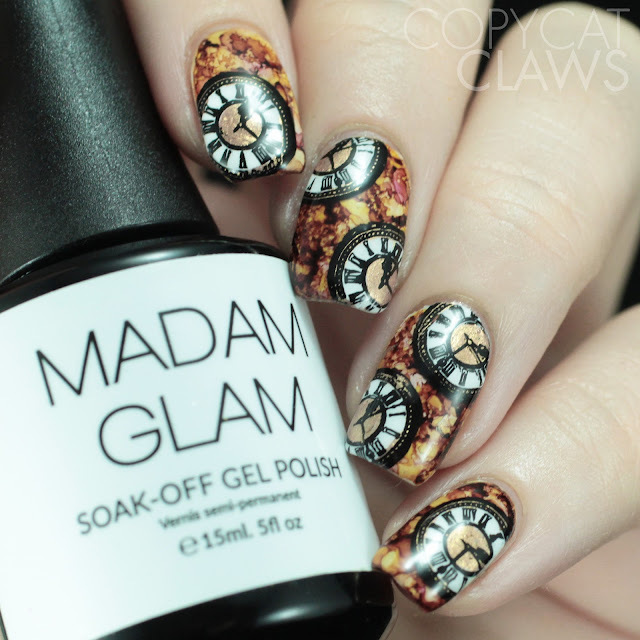 Since there's not nearly enough subscription boxes for us nail art lovers out there, I think this is a wonderful idea! 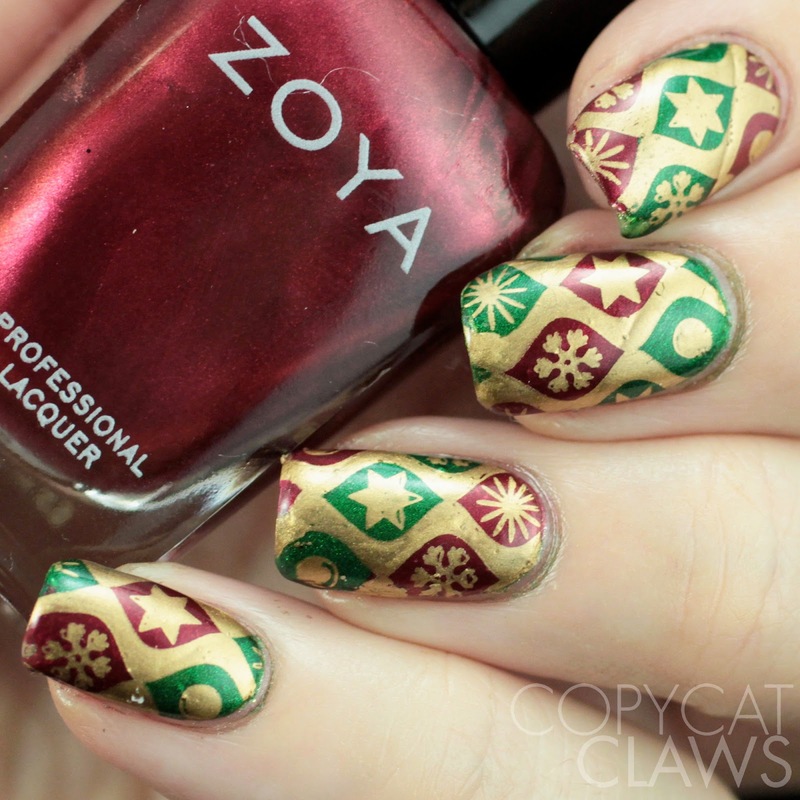 Each month you receive 2 stamping plates (made just for the box), 2 stamping polishes and a surprise. I received the December box which was winter/holiday-themed. I did 4 manis with the products in this month's box. I hope you like them! Hey there! 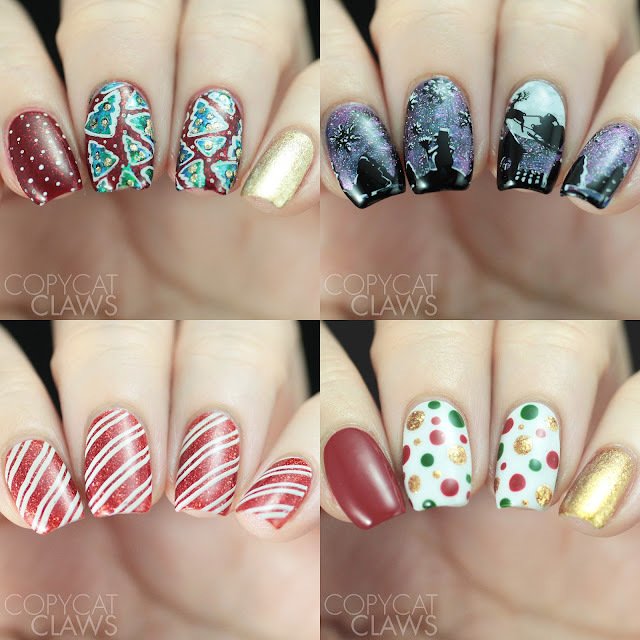 I'm sure it's not shocking that I've been wearing a lot of Christmas-themed nail art in the last couple of weeks. So much that I'm not sure I'll actually be able to blog it all! These are some that I thought looked like wrapping paper. Especially since they ended up a bit flawed and creased-looking. You can ask anyone in my family about how terrible a gift wrapper I am. Even with their mistakes, these are perfection compared to any present I've ever wrapped! Hey there! It's that time of year when Nail Polish Canada puts on a little nail art contest. As a long time NPC customer, I couldn't say no to that! As much as I'd personally appreciate the votes, you can vote for any of the nail art you love the most in the link here. I've been checking it daily and have seen some great designs. 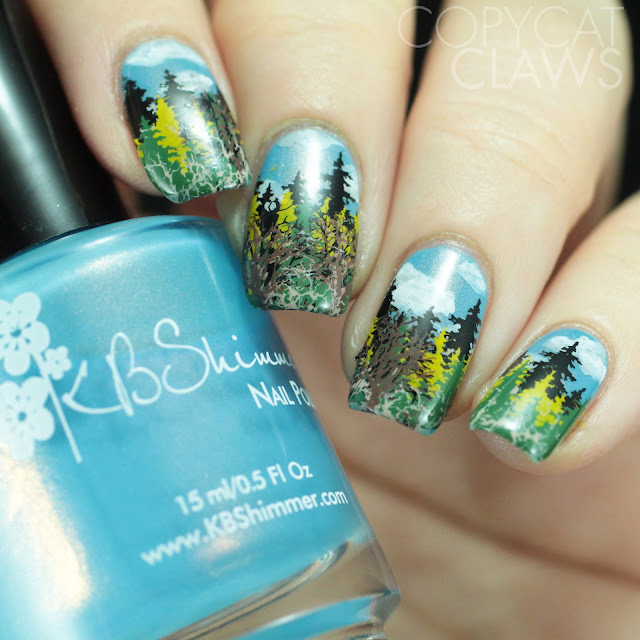 Us nail ladies have some talent! Hey there! Happy Friday! It's the final day of this month's Digit-al Dozen theme. 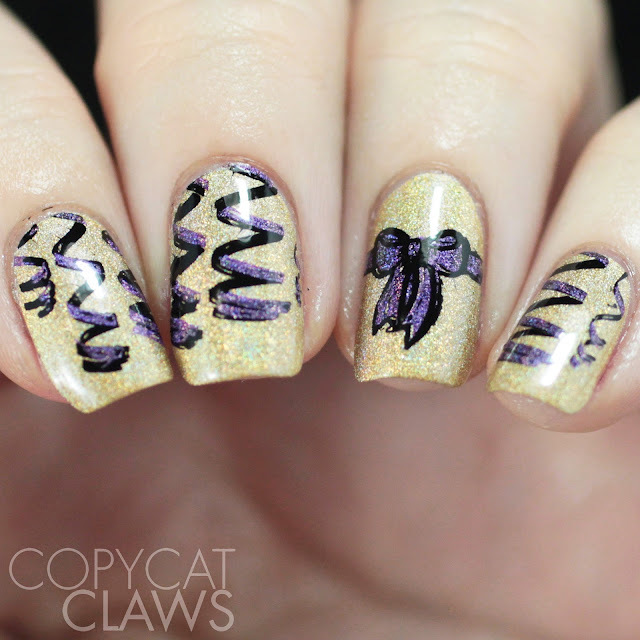 It also happens to be the day the Nail Crazies Unite group is doing Ribbons/Bows so I combined the two into a sparkly holiday-ish design. 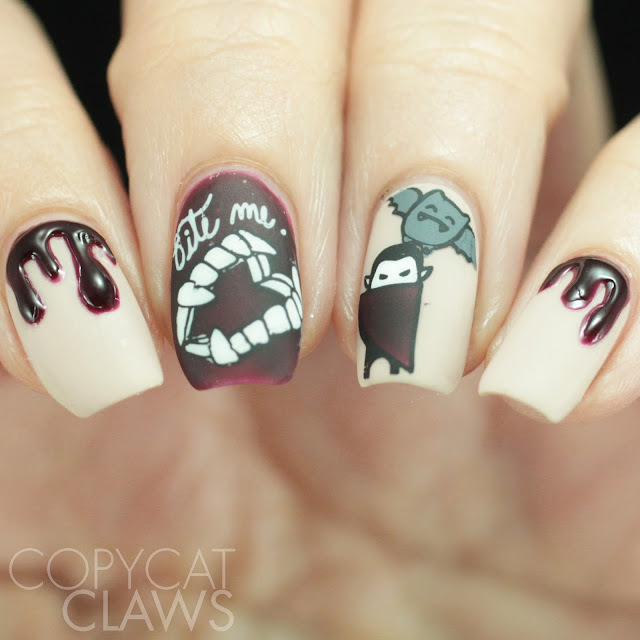 I actually did this exact mani twice. 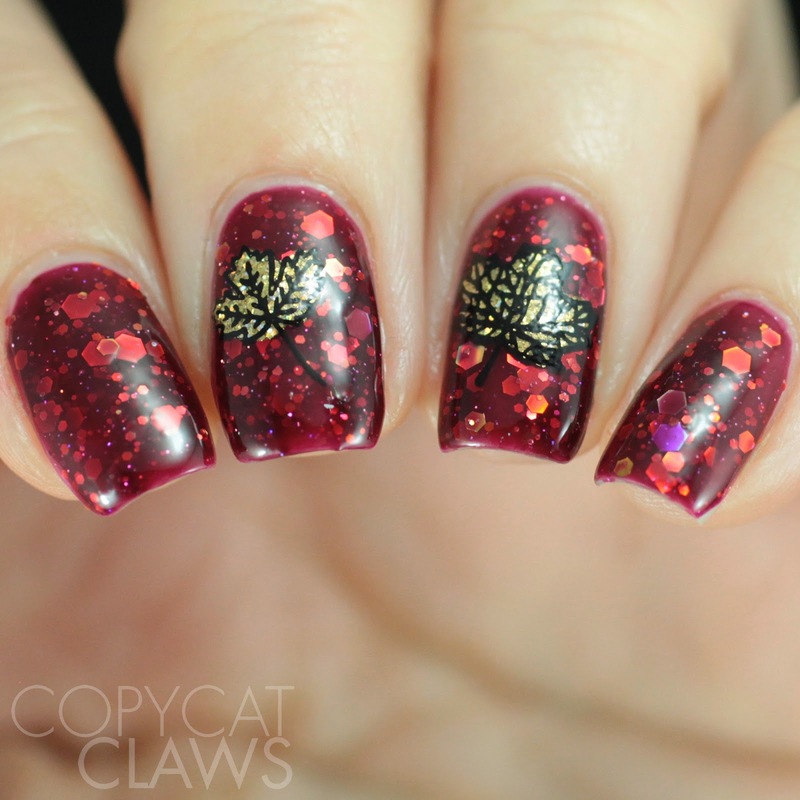 After looking at my photos (after wearing it as a full mani for at least a day or two) I wasn't happy with my stamping so I redid it last weekend while binge watching The Final Table on Netflix...as in I watched the entire show in one sitting. I clearly was not in the mood to accomplish much on Sunday. Hey there! It's already Day 4 of The Digit-al Dozen's Holo Week. Now that my co-worker has solved my "the internet is being a jerk" problem, I get to take a minute to blog! Woohoo! For today's holo mani, I used holographic glitter polish (the most blingy polish I own, in my opinion) with some stencils. These are so freakin' sparkly that I think they would've been great for a New Year's party or something. Sadly, I only wore them in the privacy of my own living room. I'm such a party animal! Hey there! Another late evening post from me. I don't know how I keep getting so distracted and end up doing this when I should be doing my nails! 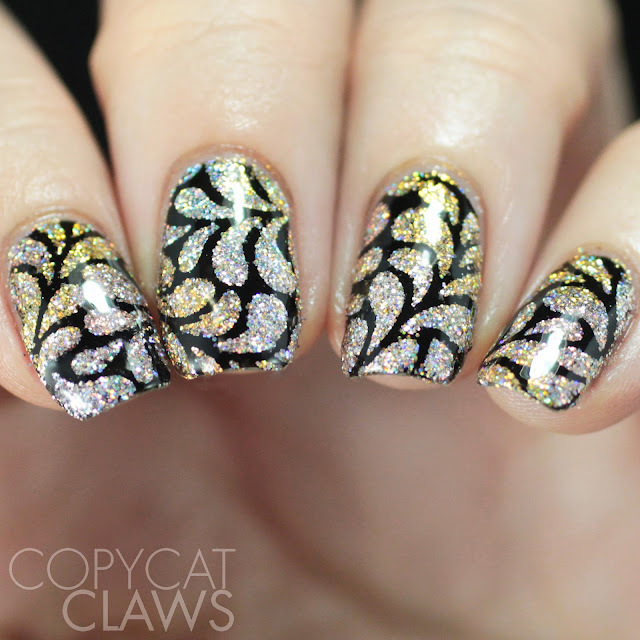 But at least I did make it for Day 3 of The Digit-al Dozen's Holo Week. 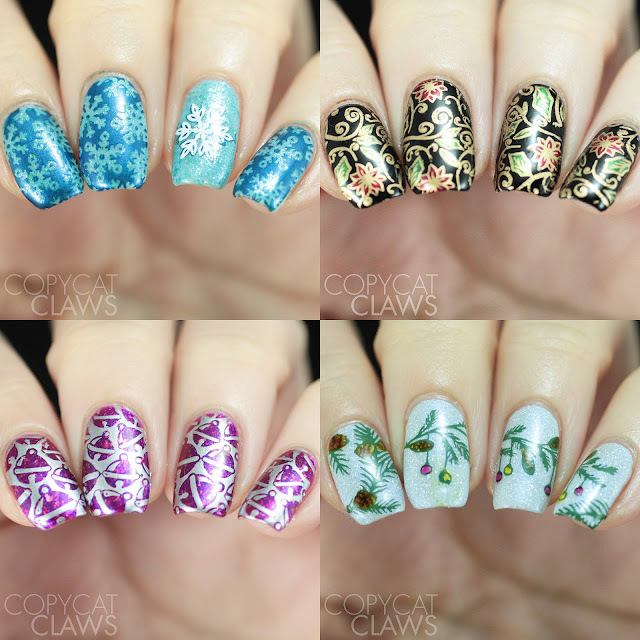 For today's post I wanted to use some of Moonflower Polish's recently released holos. 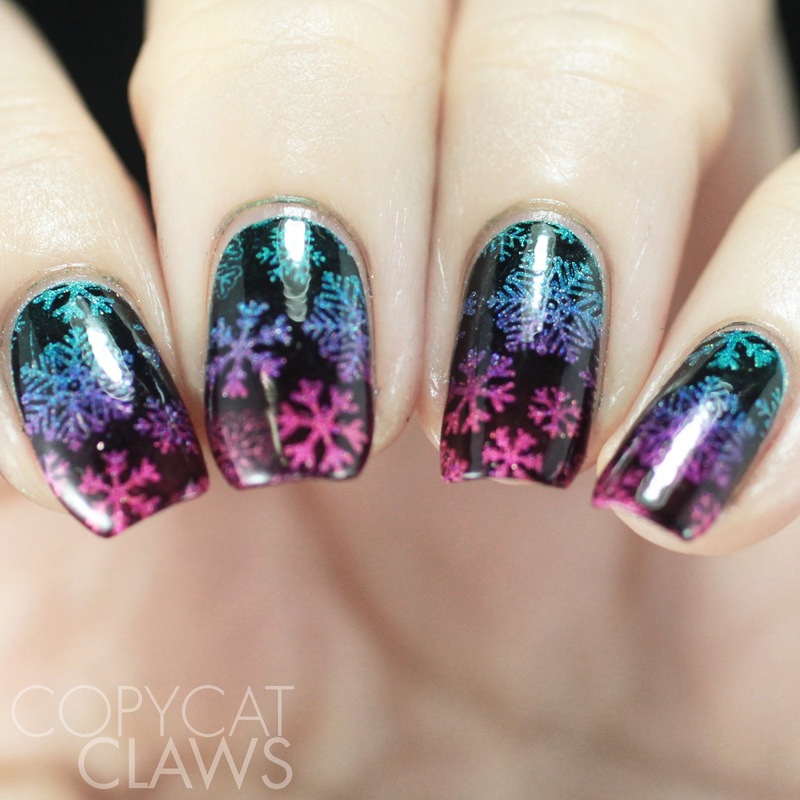 I thought it'd be fun to do a brightly coloured gradient with snowflakes....probably because it feels like we've been snow-covered for 100 years and I'm craving some color. Though I do have to admit, where I live really does still have a huge bright blue sky. Hey there! For Day 2 of The Digit-al Dozen's week of Holo, I decided to step away from the holiday nails for a second and do some nails that were inspired by What's Up Nails Mermaid Brushes that I talked about last week. 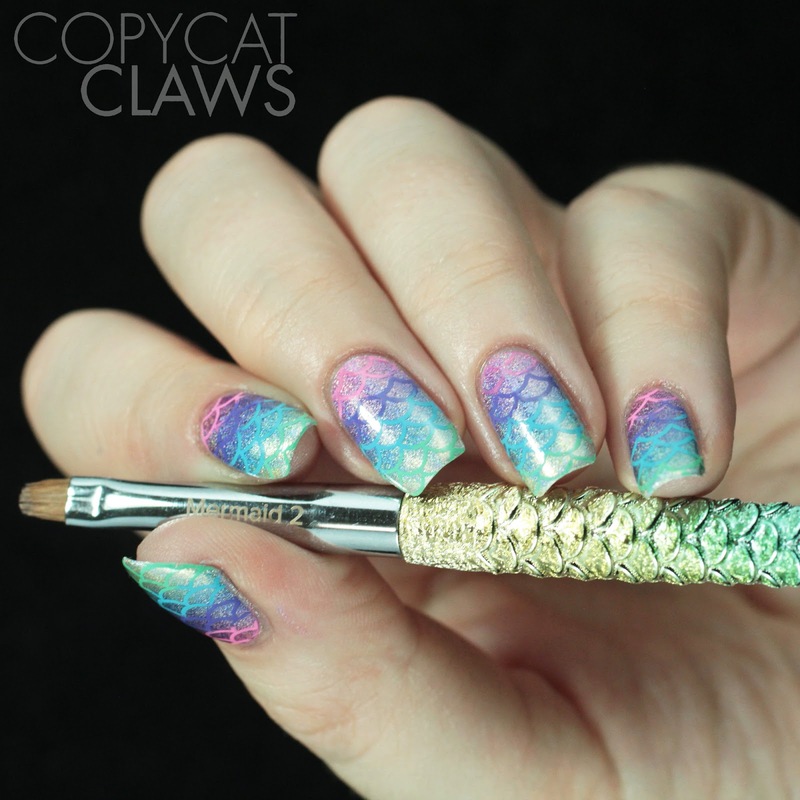 Originally I had done some holo stamping decals but when I got these brushes I thought they were so pretty that I wanted to do a design inspired by them. 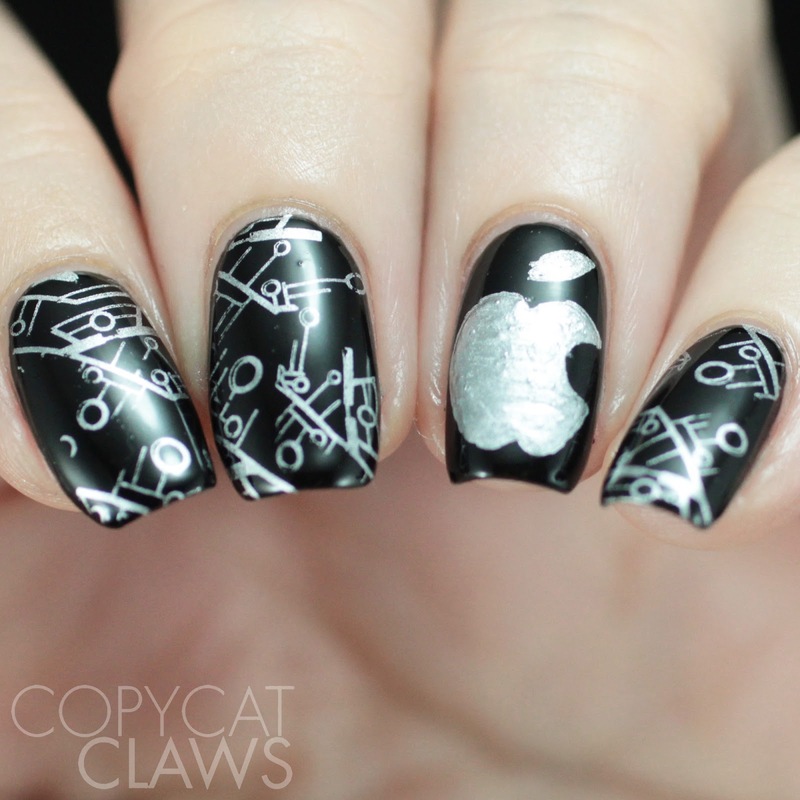 So the decals can wait until later to blog about. 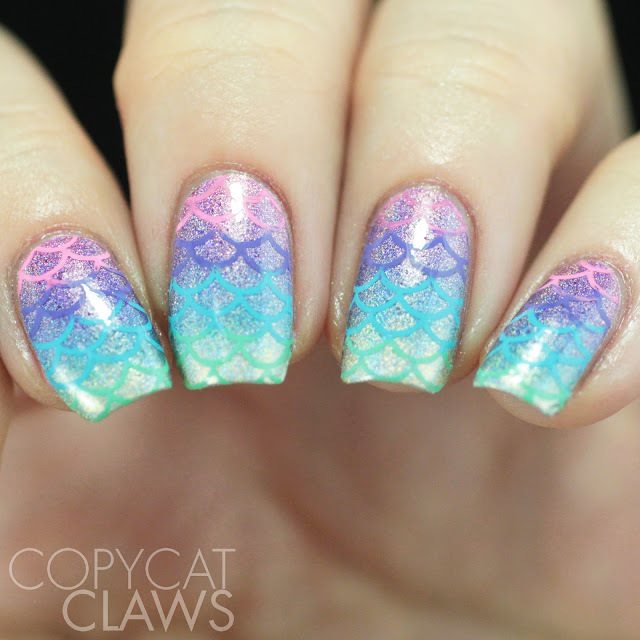 Instead, I have holo rainbow mermaid nails to share, that are way cooler! Hey there! Hooray, it's time for a new Digit-al Dozen week! 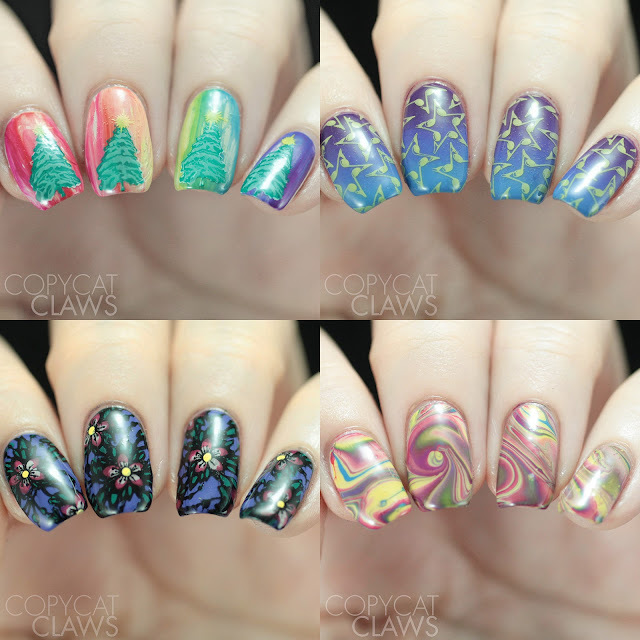 This week we're doing Holo, which makes me happy since we can do holiday nail art or not. I personally have a mix. It did, on the other hand, teach me how terrible I am at photographing holographics. I even took the top off my light box to try to help me out but I still don't think I managed to capture the rainbow-y goodness of the polishes I used for this week. Even if I couldn't photograph the wonder of these polishes, today's mani stole my heart. I actually did two versions. 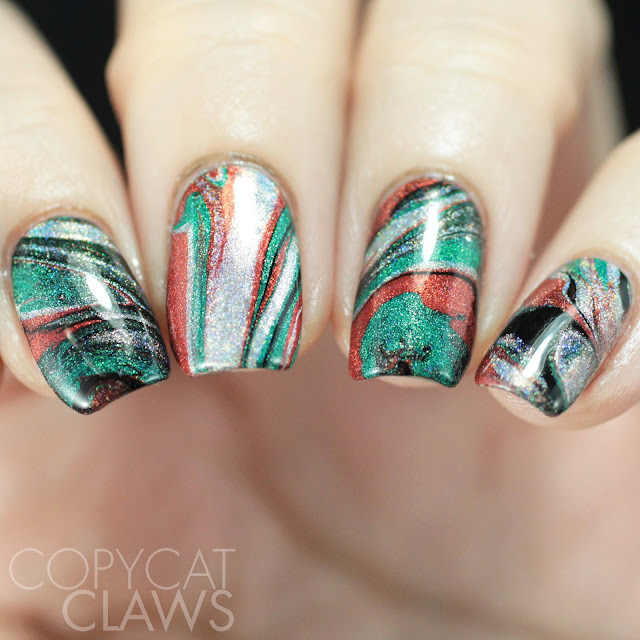 First I tried a real water marble (which I'll share at the end of the post) but that got less than pretty so I did a drip marble. 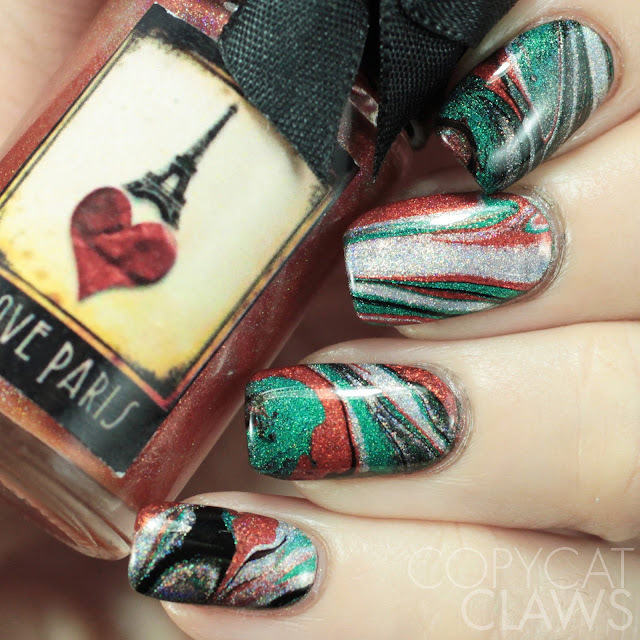 Who needs a water marble when you can do a drip marble?! Hey there! How's this for a rare weekend post?! But I recently joined the When Colours Collide Facebook group and they post on Sunday so here I am. 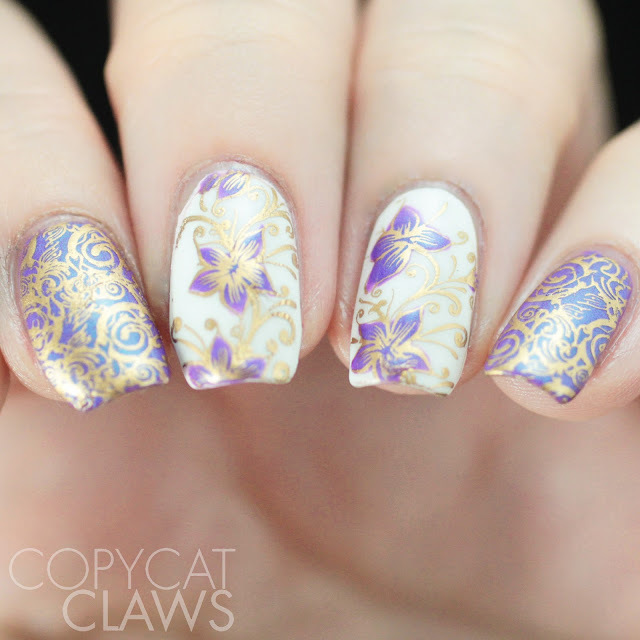 This week's color combo was purple, white and gold. 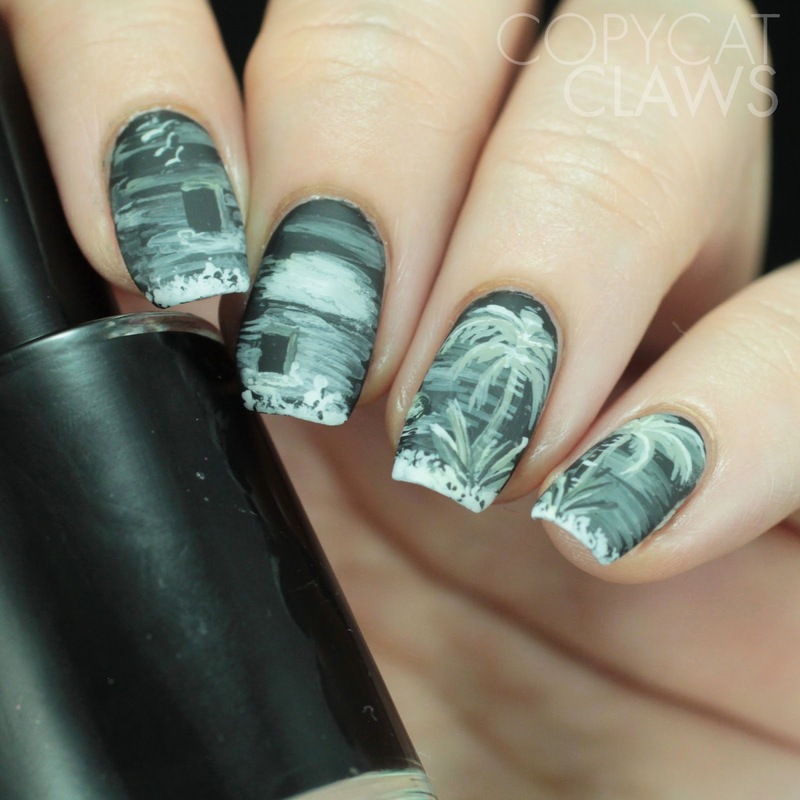 When I saw that I thought it'd be a nice combination for one of the images on the Whats Up Nails B032 (Floral Swirls) stamping plate I recently received. I think I was right, if I do say so myself. I also did a second Floral Swirls mani while it was on hand. Here they both are! Hey there! Last month when Girly Bits Cosmetics announced they were releasing a new set of creme polishes for 2018, I was definitely excited. I've used the 2017 collection in a ton of nail art so I snatched up the new collection literally within a minute of it being available. 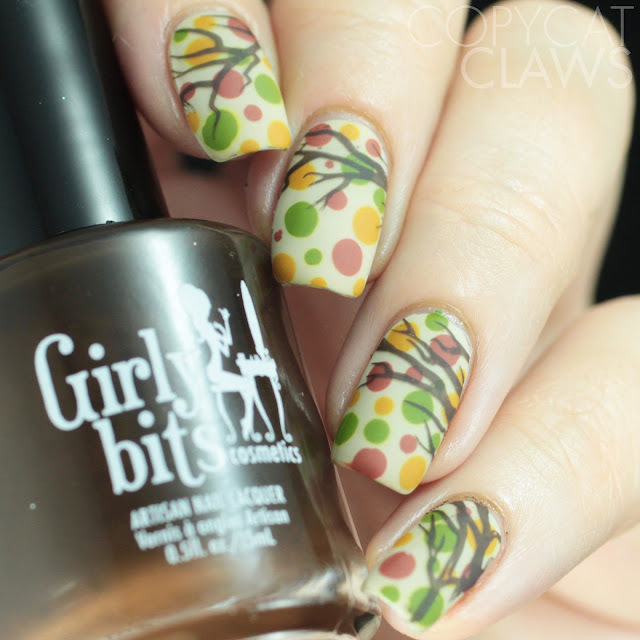 The colors are outside the realm of "typical" fall colors and really provide a range of colors that seemed useful for even more nail art. So you just knew I had to play with them a bit. These are the results of that playing. 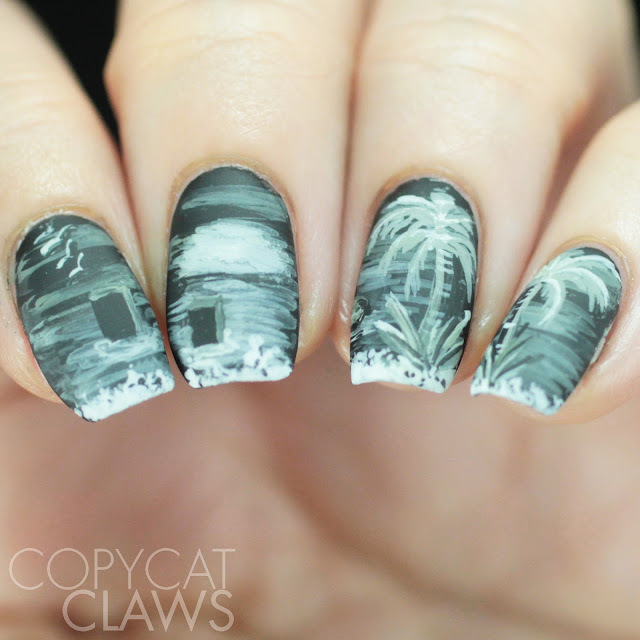 I wanted to test them out with some of my more common techniques (mostly stamping, of course) but there's a bit more here, as you'll see. Hey there! I'll try to not make this the most whiney blog post in the history of mankind but it should have been done on Friday. But Friday was my birthday (the big 4-0, I can't believe I'm admitting that to the whole internet) so I left work a bit early to celebrate with a few drinks (maybe more than a "few") instead of finishing my blog. I had been sick all of last week with a cold/cough which I fought through since Thursday and Friday were going to be busy work days. And I did it! And I had a great birthday evening. But by Saturday I seemed to have come down something of a stomach flu so I'm running at about 45% right now. I couldn't even stomach the lovely birthday dinner I had with my family last night. Because of the combination of celebration and illness, I'm days behind on getting this post up. 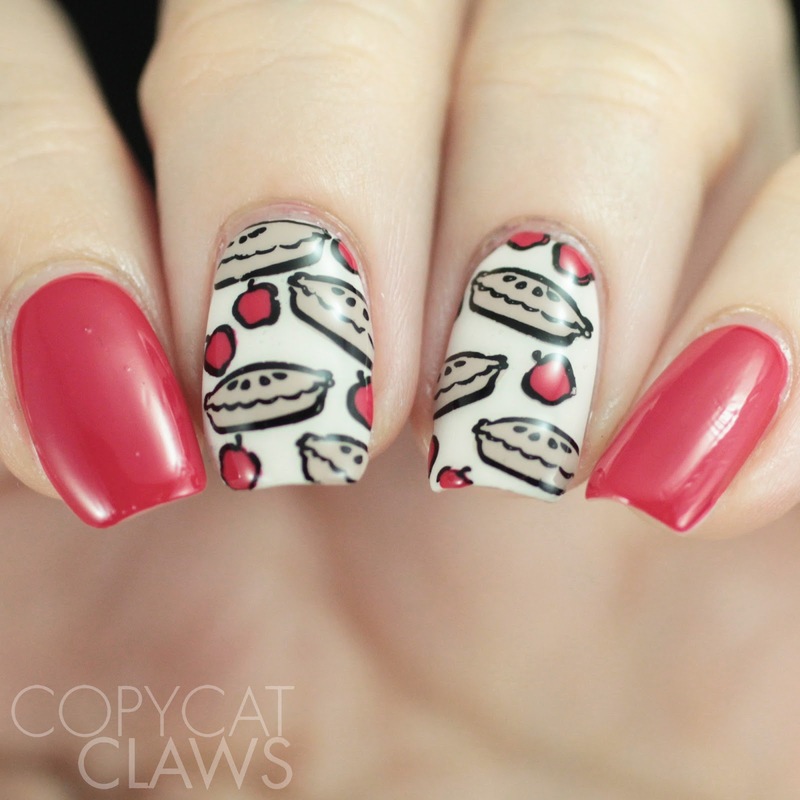 Friday's Nail Crazies Unite prompt was Holiday Food & Drink and I did one of my favourites...apple pie! Yum!! Hey there! 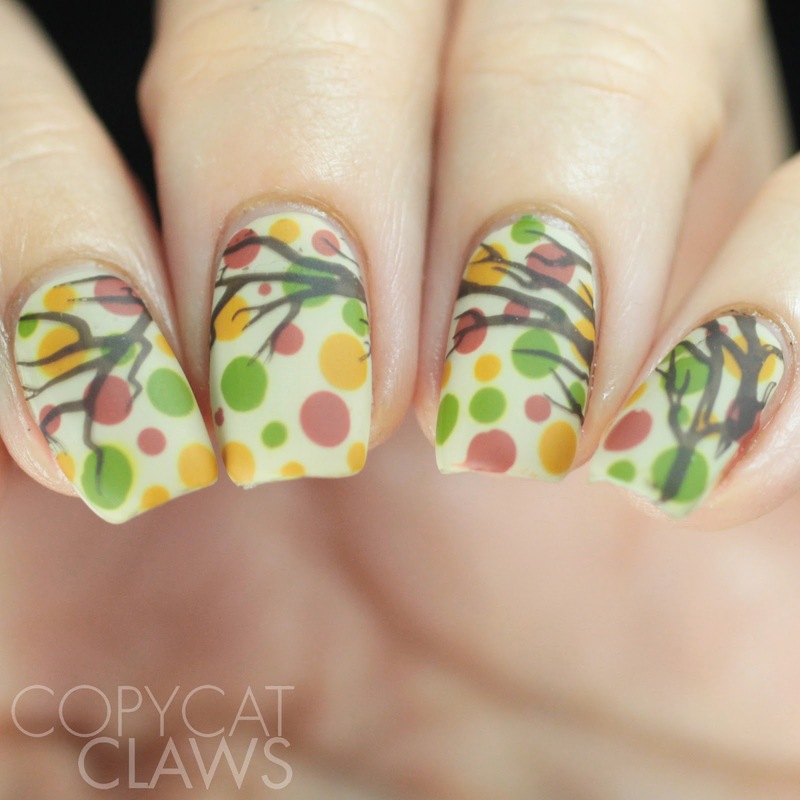 Since I have done two more mani's with fall leaves this year that I haven't shared it, I figured I might as well pop in and post them today. It's going to be December in two short days so it's now or never! Hey there! 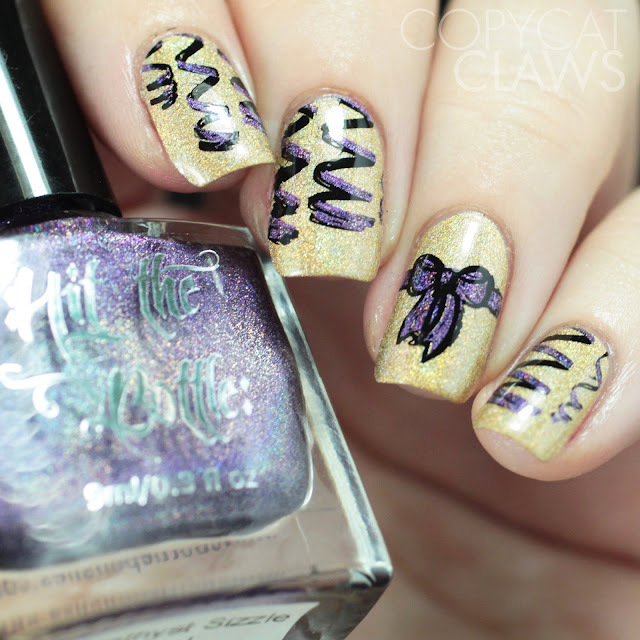 Last week I received a new package of awesome products from Whats Up Nails, one of my favourite nail art suppliers. 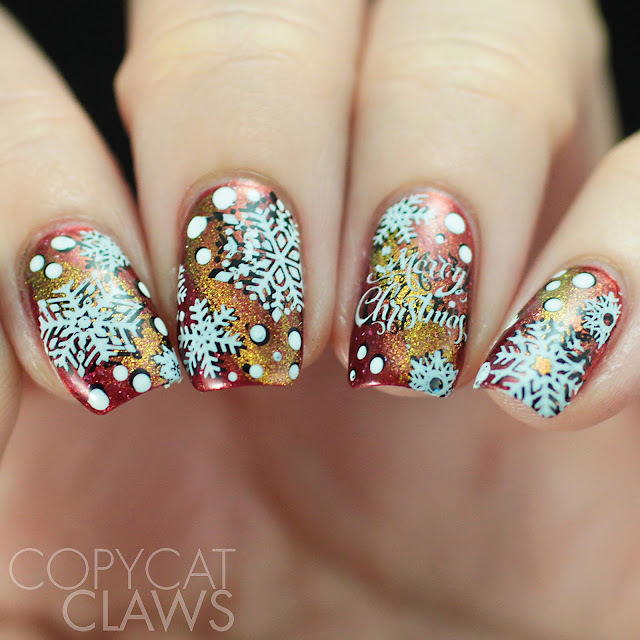 It appeared that some of the stencils were fall and halloween themed so I thought I better start playing with them right away before the entire world is covered in snow (yes, I know the entire world will never be covered in snow but since I live in a northern city, it feels like a winter wonderland already). Hey there! Early Thanksgiving to any of my American friends out there. Since your turkey day is almost here I thought now would be a good time to start looking at the next holiday's nail art... Christmas! I just so happen to have UberChic Beauty's 2018 Christmas plate, Happy Christmas, to help me do that. I've had it in my hands for a few weeks already so I've gotten to play with it quite a bit. I didn't want to go full Christmas yet so there's not a ton of red and green but I'm sure you'll be seeing plenty of that as soon as Thanksgiving is over. Hey there! I hope everyone had a great weekend. Mine was really nice, getting to see family and some friends I haven't seen in a too long. 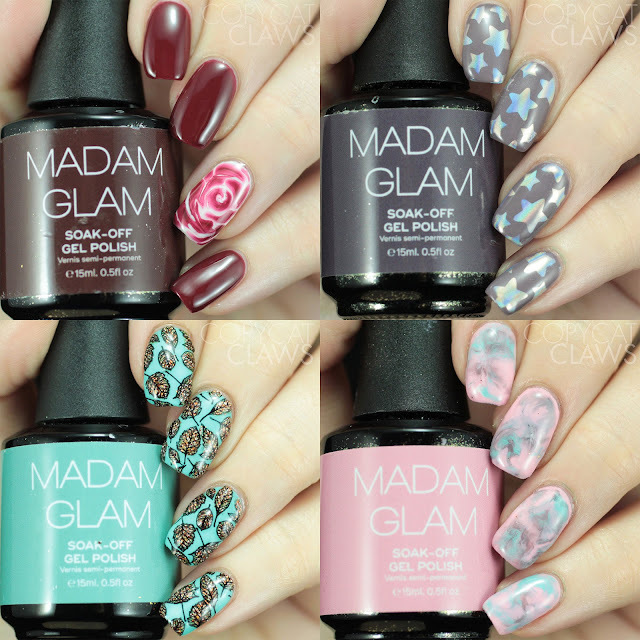 But now it's back to work reality but I decided to take a little break to write up a blog post about some gel polishes I recently tried from Madam Glam. I don't use gel often but when I do, Madam Glam is my go-to brand. I have purchased/reviewed a few and they're consistently great. They're more opaque than other gel brands I've tried and always apply nicely...hence they're my go-to. 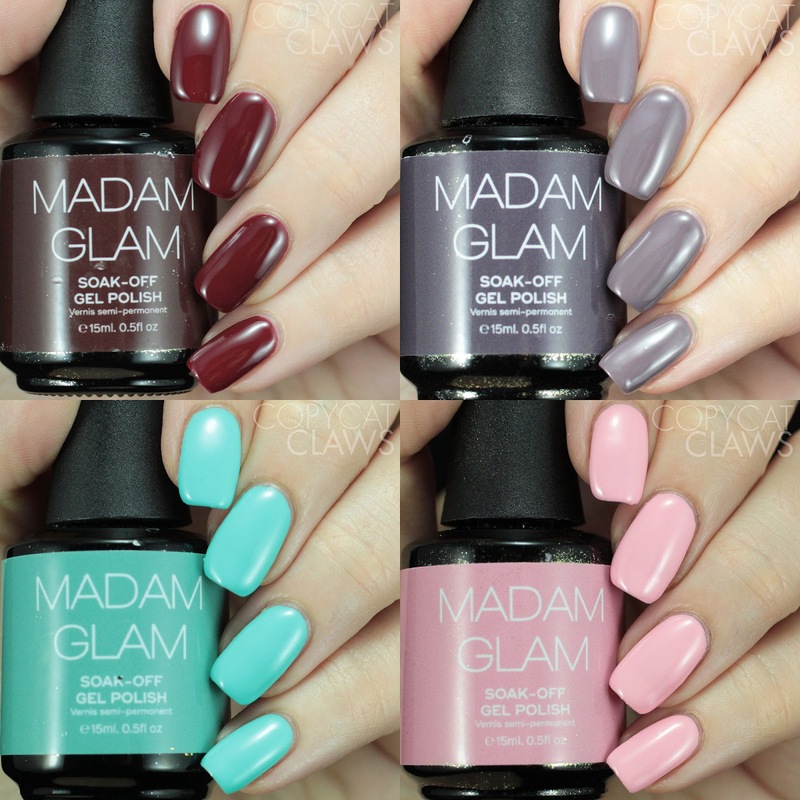 I received 4 polishes in this package, plus their no-wipe top coat which I used for all the swatches. 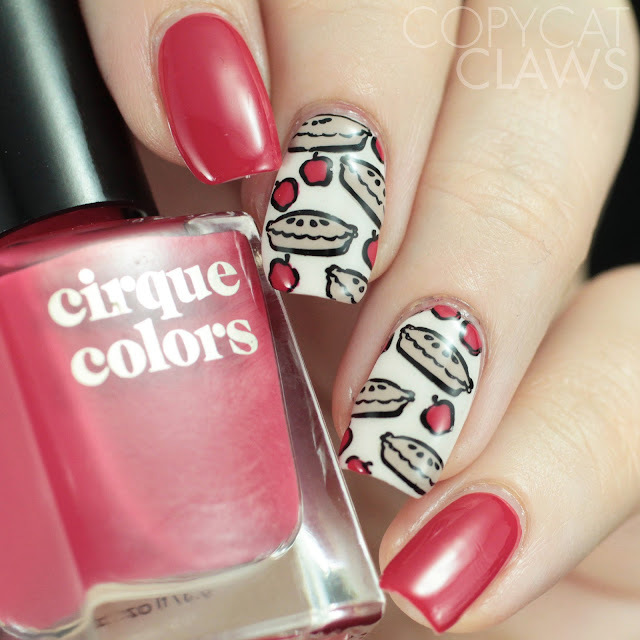 I also decided to do a bit of nail art with each of them that I hope you enjoy. Hey there! It's Day 4 of The Digit-al Dozen's Look Up week. 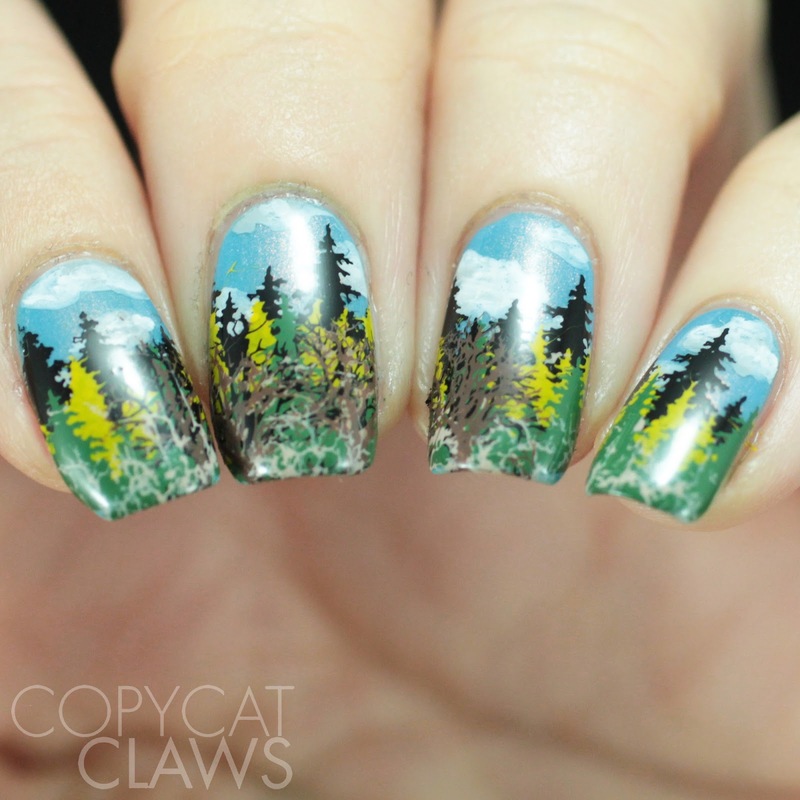 Today's post is something that I see approximately 80% of the time that I look up but much closer to my face than the other things I've put on my nails this week. It's Apple products! I've become one of those people who are uncomfortable being unplugged so it feels like I'm almost always looking at either my laptop or my phone. I should be much more comfortable being without external distractions but I'm not...at least not right now. 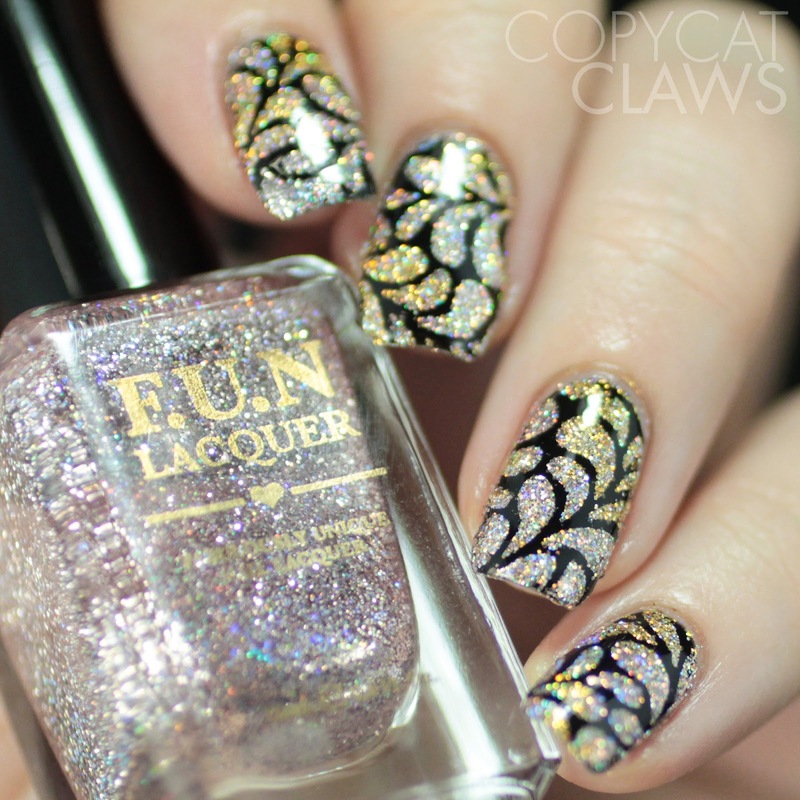 On the plus side, it means I got to do this shiny nail art! Hey there! 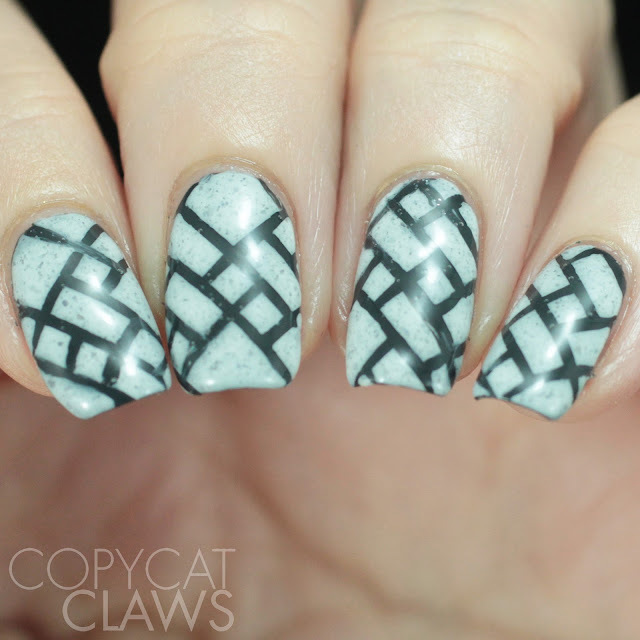 Continuing with this week's Digit-al Dozen theme of Look Up (The First Thing You See), I did some time-related stamping. I realized that I am VERY uncomfortable when I don't know what time it is (which is somewhat ironic since I'm almost always late for everything). The only time that doesn't apply is when I'm at the lake since that's the place where I'm relaxed and time has no meaning. But at home, I've been wearing a watch since I was in grade 4, there's a clock in both my labs (and in the lab through the window where I frequently check their clock to make sure mine is correct), a clock in my bedroom, two in the kitchen and one in the living room. Not to mention, my computer, my phone, my car and my PVR. 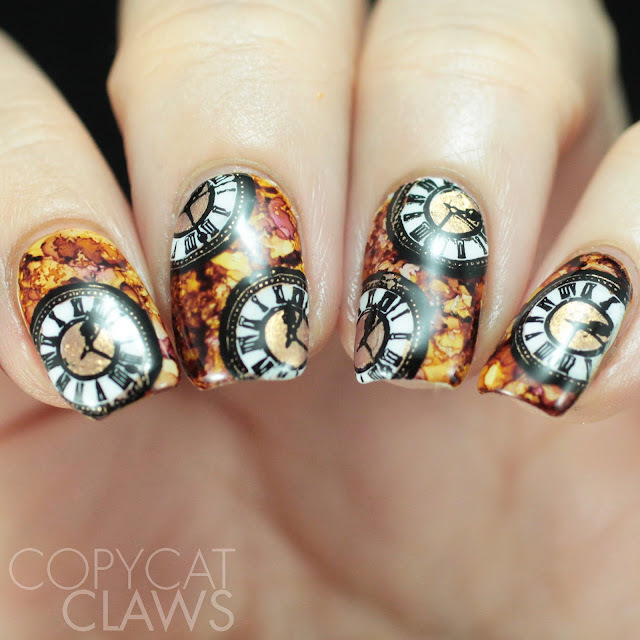 So, while none of my clocks are as fancy as this stamping image, I certainly look up and see the time almost constantly. Hey there! It's time for this month's week of Digit-al Dozen goodness! This month our theme was "Look Up - First Thing You See". This one was a challenging but fun one, that I took quite literally. It also taught me that I don't have a whole lot of color around me which is a bit depressing! 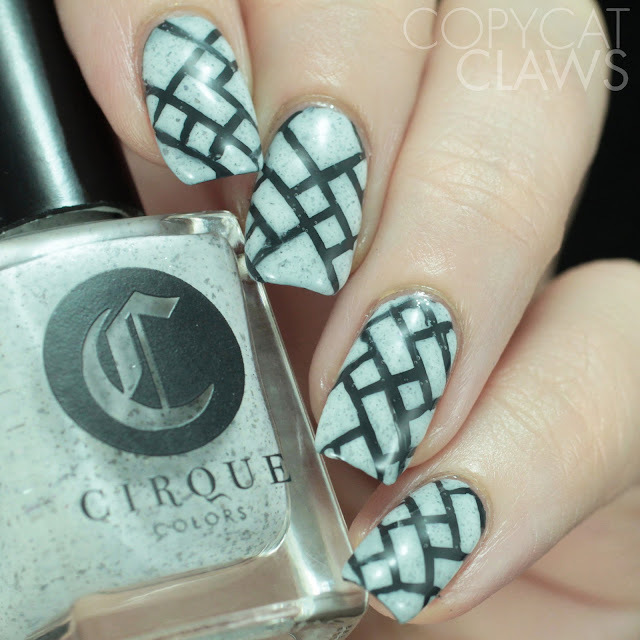 I ended up with almost all black/white/grey or shades of beige designs this week. My first one was inspired by what I see when I look up ~40 hours per week...the plain old ceiling tiles in my office at work. You know the kind. They're grey with little holes in them and can be found in pretty much every office across the land. 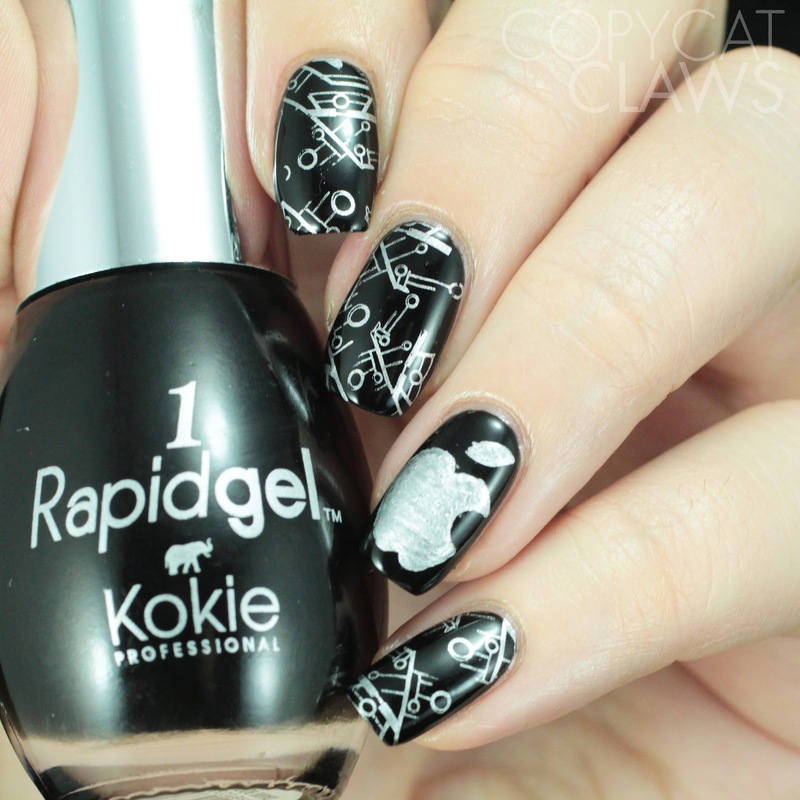 I actually did two manis with this idea, the first with stamping, but I prefer this one using stencils. Hey there! As a Canadian, Thanksgiving has come and gone for the year and I didn't even do a mani to celebrate this year. BUT American Thanksgiving is coming up in a couple weeks! 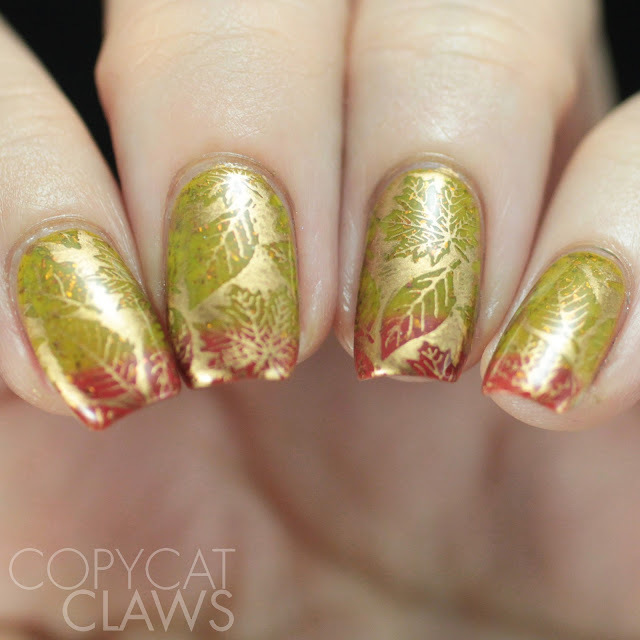 With the help of UberChic Beauty's Give Thanks stamping plate, I got to do a couple of Thanksgiving manis which will, hopefully, give some of my American friends out there some inspiration. Hey there! 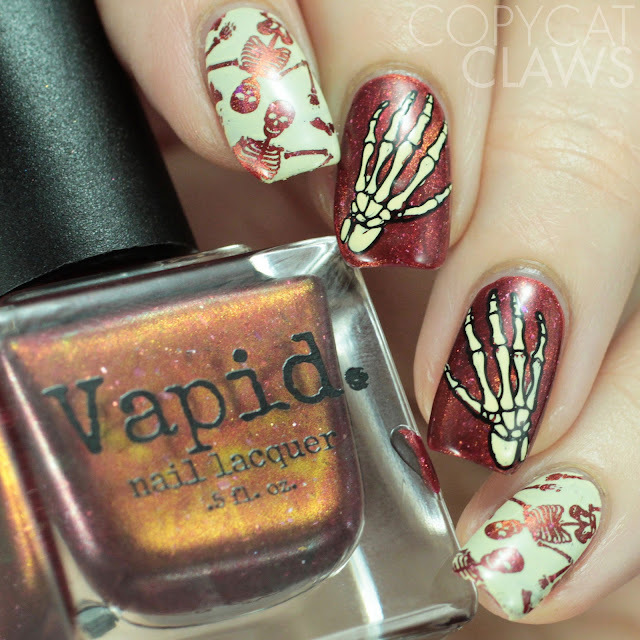 Now that Halloween is over I'm back to posting non-holiday nails. Today's Nail Crazies Unite prompt is Plaid. I happened to do these before I even know UberChic was coming out with a plaid plate (which ended up being AMAZING). Luckily, I do have other plaid plates. UberChic's is great because the layering ideas are obvious and plentiful. I had to make do layering plaid off a different plate with images that made it a bit more challenging but I still like the outcome. Hey there! Happy Halloween! Today's blog post is sharing the actual design I'm wearing today. Vampires were one of the only Halloween stereotype that I haven't done yet this year which is pretty much blasphemy for me since I love vampire lore. So here we have today's vampire nails! Hey there! 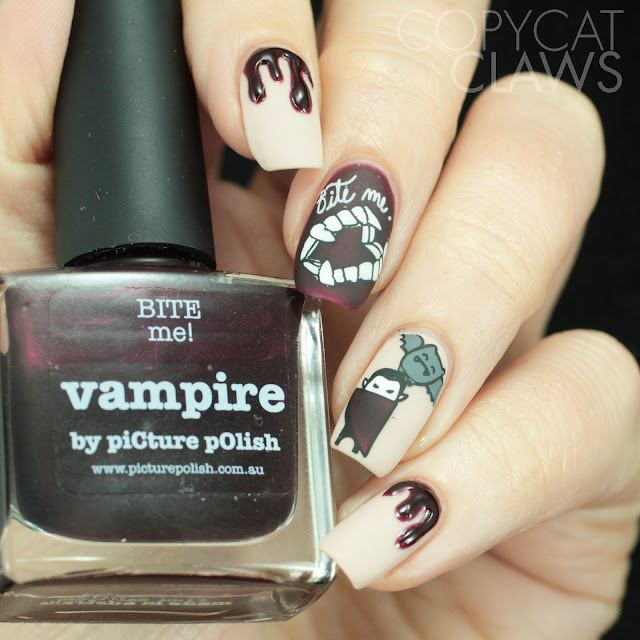 It's time for yet another Halloween mani. 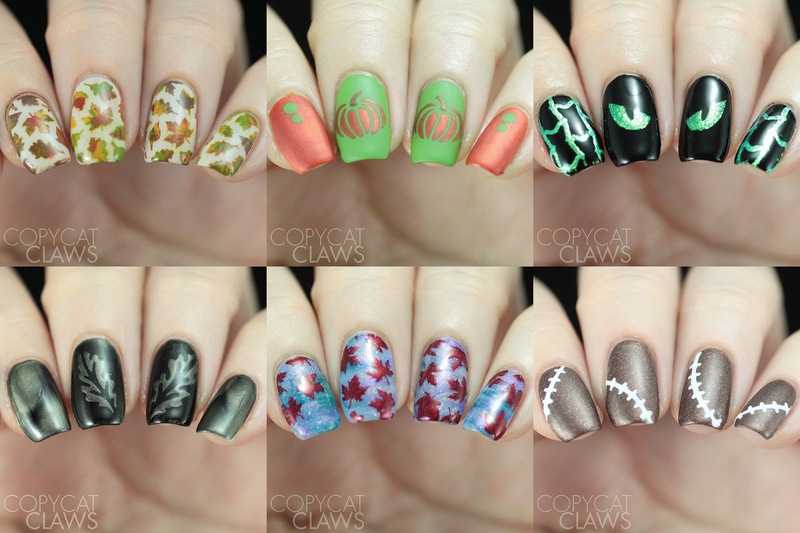 I know it seems like it's all I've been posting lately but I like Halloween nail art so I'm trying to squeeze in all the manis I've worn over the last week or two. Assuming I do my nails again tonight (which is pretty likely since I have no other plans tonight), I'll probably have one more to share tomorrow. 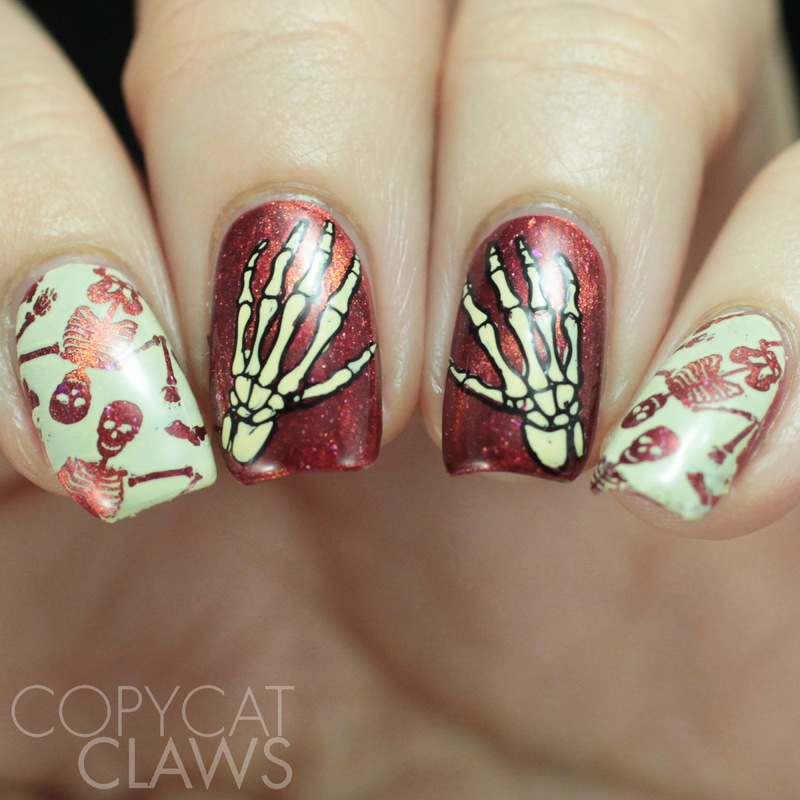 But for today, I have some skeleton stamping I did late last week.